Crisp fall weather can be wonderful in scenic south-central Pennsylvania — too nice to be indoors! 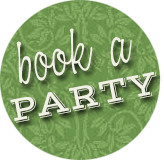 Come out to Paulus Orchards and let us host your fall birthday party – or any type of party! There’s so much to do at the farm, and we promise to make it a memorable occasion for you and your guests! Four reserved picnic tables under a tent for two hours – you may bring along extra folding tables or chairs if desired. All day admission to PlayLand which includes all of the attractions included in our basic Farm Admission. Saturdays 9am-6:30pm, Sundays 12pm-5:30pm. Your tables will only be available for the 2 hours you reserve. They’ll be needed for other parties at other times. You may set up your party area no more than 30 minutes prior to your start time. Enjoy a Wagon Ride at your convenience. They run continuously. We recommend doing it before or after your two hour table time so it doesn’t take away from your table time. You are welcome to bring along decorations and food. Smoking, alcohol, and open flames are prohibited. Click the green circle to book! Children 2 & under and adults over 70 are free for parties! All other guests are $8.49/person with a minimum charge of $200. All guests must check-in at red shed to receive an armband for admission. A $30 non-refundable deposit is required to book your party. Deposits are refunded if party must be cancelled due to rain.